I was recently awarded two blog awards by one of my new bloggy and Twitter friends, Tina at Life Without Pink. I didn't have to buy a fancy, new dress, shoes, clutch or jewelry. No red carpet here. Just honest awards. The various blog awards that are circulating in the blogosphere are better, believe it or not, than the golden statue which are being handed out this evening in Tinseltown. They are heart-felt and genuine. So, I'd like to thank Tina for honoring me with these awards. 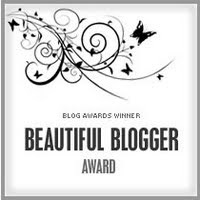 Hop on over to Tina's post to read her answers and to check out the other fab bloggers to whom she handed out awards. 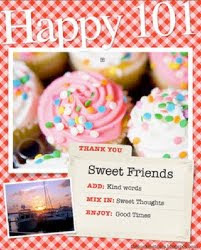 The first award is the Happy 101 award. 1. When my husband tickles our daughters. The outrageous laughter always makes me happy. 2. A White Chocolate Mocha from Starbucks. 3. Watching the movie You've Got Mail. 4. The 2 hours of time that my husband and I spend together after the girls go to bed. 5. When my daughters play contentedly together. 7. My daily phone chats with my sister Brenda. 8. Temperatures above 75 degrees F.
1. I once wanted to be a pastry chef. 2. I had a crush on Mick Jagger when I was in 8th grade (don't ask). 3. I am so grateful to live in a town that is less than 2 miles from the beach. My favorite month here is September when all of the tourists have left and the weather is still amazing. 5. I've been to Iceland. 6. My first concert was Rick Springfield. 7. I love to read. I'll read anything...books, magazines, newpapers, even brochures in the doctor's office. Now it's my turn. I'm bestowing these awards on a few of my new friends as well as some of my longtime bloggy buddies. 5. Angie at Just Shy of a "Y"
What a great post. Thanks for linking up! And wow Iceland, really? Must hear about that! Thank you so much for the award...congrats on your awards too! Don't you just love blogland? There are so many fun people to meet!!!! Hope all is well. I haven't blogged much lately. It was nice hearing from you.